Recent clashes in Baltimore over the death of Freddie Gray have shined yet another light on the mounting tensions between black communities and police in America's cities. But it is far from the whole story. When comparing measures of income, employment, poverty, housing, incarceration and overall health, the city's black residents are living in a very different city than their wealthier white neighbors. 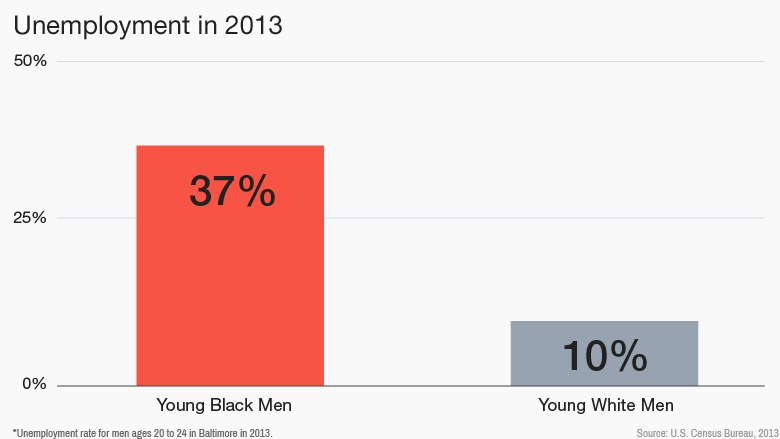 Just over 63% of Baltimore's population is black and here are some of the stunning disparities they face. 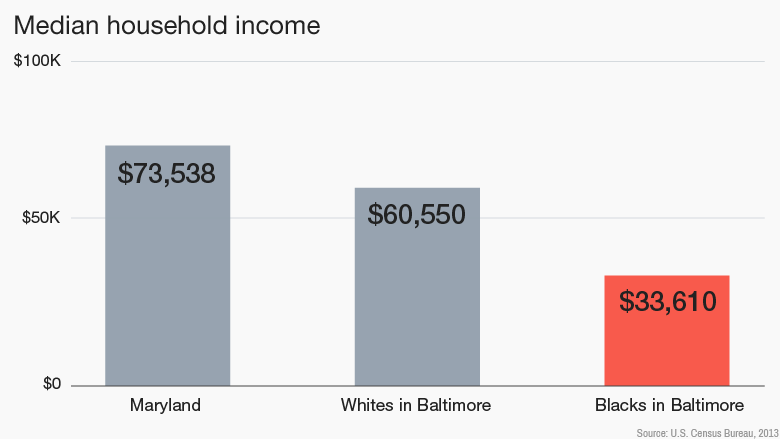 Baltimore is located in the richest state in the country, Maryland, which makes comparing the incomes of blacks in Baltimore to the median income of the state overall particularly stark, with an almost $40,000 a year a difference in earnings. 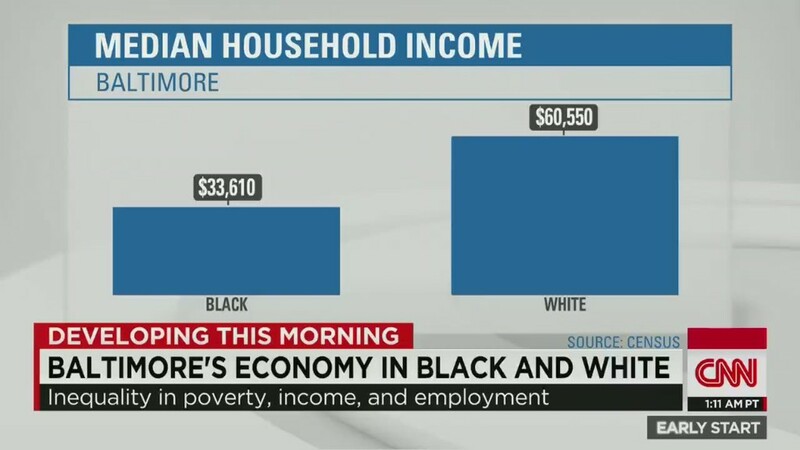 But even if you compare the incomes of blacks versus whites living within the city of Baltimore, a large chasm still exists. White residents in the city make almost twice as much as black residents. The gross disparity in income has a lot to do with jobs. Decades of decline in the manufacturing and shipping industries and a shrinking population have left large sections of the city in economic despair. Meanwhile, there's been an influx of jobs in fields that are seeking white collar, college-educated workers, such as cyber security, life sciences and information technology, said Anirban Basu, CEO of Sage Policy Group, an economic and policy consulting group in Baltimore. For young black men between the ages of 20 and 24, the unemployment rate was an astounding 37% in 2013, according to the most recent data available from the U.S. Census Bureau. That's compared with 10% for white men of the same age. Even though hiring has picked up in Baltimore since 2013, Basu says the trend continues. And overall, unemployment is still much higher in Baltimore than it is nationwide. The housing picture is not any prettier. The median value of owner-occupied housing units in Baltimore is $157,900. That's barely half the $292,700 median for Maryland and still fairly well below the national median of $176,700. Abandoned buildings have long been a problem. The city has an estimated 16,000 vacant buildings and another 14,000 vacant lots, according to the Housing Authority of Baltimore City. And some neighborhoods are far worse. In the blighted neighborhoods of Sandtown-Winchester and Harlem Park, the area where Gray reportedly lived, almost a quarter of buildings were vacant in 2011, according to the city. 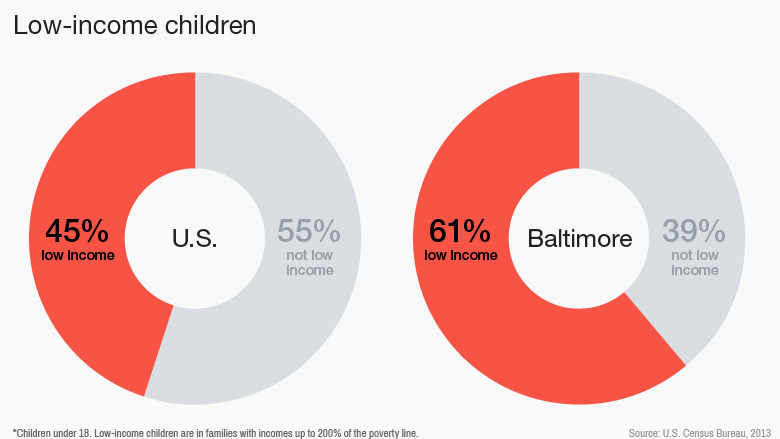 Nearly 24% of Baltimore's population is living below the poverty line, which is $20,090 a year for a family of three. The percentage goes up from there when looking at just children, with 35% living below the poverty line and 61% living in low-income households that have incomes that are less than two times the poverty level. Baltimore is home to Johns Hopkins University, one of the nation's top medical schools and hospitals, but it is not the healthiest city. 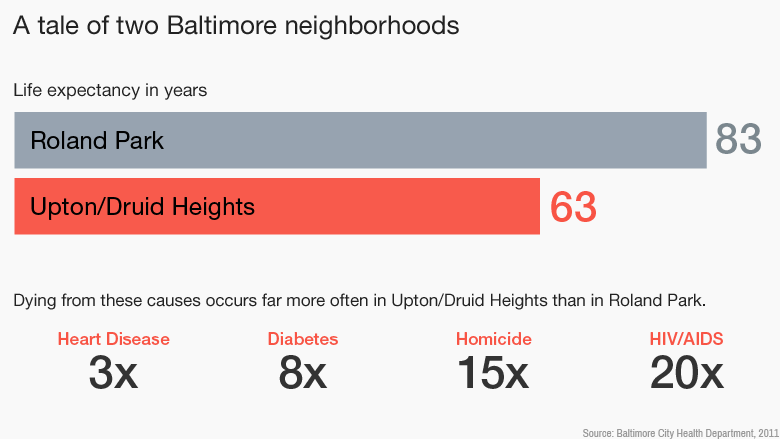 Life expectancy rates in the neighborhoods of Upton and Druid Heights -- where median income is well below the poverty line at $13,388 a year -- is only 63 years old. That's 20 years lower than the 83-year life expectancy for Roland Park, less than five miles away. In that neighborhood, the median income is $90,492. One reason the economy in Baltimore is so depressed is because so many of its residents are in prison. One-third of Maryland residents in the state's prisons are from the city of Baltimore. And it comes at a huge cost to the state: An estimated $220 million is spent incarcerating people from just 25 communities in Baltimore each year.